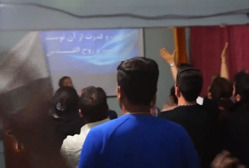 Iranians Who Love Jesus, Israel and the U.S.: An Inside Look at "Infectious Faith"
When someone gets baptized in this house church, people clap and cheer like fans at a World Cup match. CBN News Middle East Bureau Chief Chris Mitchell met and talked with some of these Iranian Believers outside of their country in central Turkey. "[It's] totally different from Iran," Iranian Christian Afshin told CBN News. "I can privilege [speak about] God's Word to other guys. I can freely praise the Lord. I can easily go to church. It's completely different." Afshin attended the church led by American Pastor Saeed Abedini, who languished for years in an Iranian prison. Following his arrest in the summer of 2012, the church disbanded. Later Afshin found himself on the run. "As a result, I came out of Iran because day-by-day it was more difficult and it was more risky for me also," he explained. "I had to change our home because I was sure that one day they would realize my home as an underground house church," he continued. "They would recognize it; the intelligence services would recognize it." Others, like Raizal and Reza, her brother, fled for their lives. "It was really a bad situation there," Raizal recalled. "I couldn't pray [to] God with all my heart because all trouble was there. Even if I say 'Jesus Christ,' they may kill me." "It become [a] problem for my job and my health," Reza said. "They tried to kill me [and] then I start to run away." 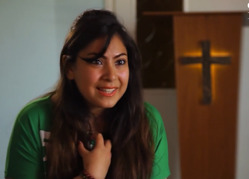 "The main church is my house, and through the Internet I connect to everybody," Reza said. "That's why it's become like an Internet church." He says a great revival is underway within the Islamic Republic of Iran. "Right now you can see the results of the Holy Spirit," he said. "From 1994, there were about 100,000 Believers. Right now, there are 3 million. You can see what the Holy Spirit is doing with the people." Many came to faith through a dream or a vision. "I had a dream. I had a dream long time back and every time that Jesus was with me," he continued. "And in all of my life, He was helping me and I didn't know who was this Person. Suddenly Jesus Christ was over there and He said, 'Come to Me.' And I came to that side and He accepted me." Despite all the hardship and being forced from their homeland, these Believers exude joy. Many hope to achieve refugee status one day and immigrate to other countries. In the meantime, they want Believers in the West to pray for the Church in Iran. "And I'm just begging, really, from the other Believers, from other sisters and brothers from all over the world, to pray for Iran and to all the people of Iran to find new God and be familiar with God, with Jesus Christ," he said.